When BC’s partnerships team were briefed on the sequel to the 4th most successful movie of all time, we knew we had do deliver a promotion with real bite. Requiring a campaign of monstrous scale to drive awareness to all audiences, we approached leading QSR, Pizza Hut, to develop a campaign across their three business units – Restaurants, Delivery & Express – this was the first time they had agreed to run a film partnership across their estate in the UK. 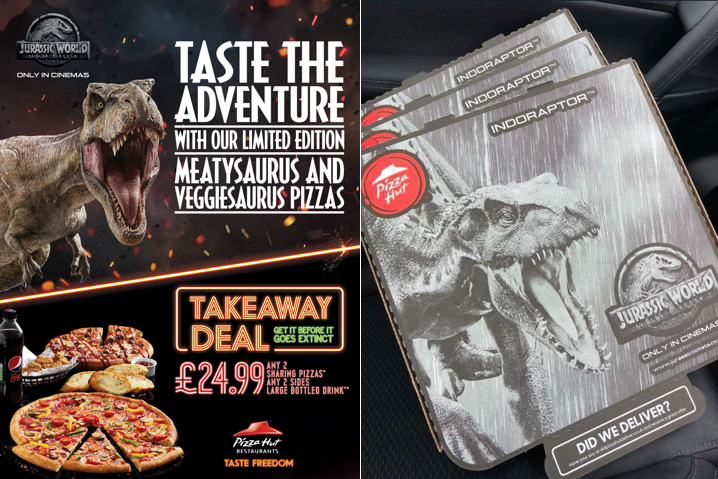 Decking out their Huts and windows with promotional POS, as well as offering two limited edition pizzas to celebrate the release of the movie – the “Meatysaurus” and “Veggiesaurus” – the brand also immortalised the iconic title treatment, T-Rex and Indoraptor on millions of pizza boxes, which were delivered during the theatrical release period. Other notable activities from the partnership included 15m DM/partnership leaflets distributed to homes throughout the UK, website takeovers along with paid social activations, eCRM and SMS comms. While on the hunt for our next blockbuster promotion, we found out that BP were looking for a promotional campaign that would help drive fuel sales during the summer. They needed a property that engaged adults/drivers, but also one that appealed to their families/kids in equal measure, wanting content and prizes that would keep kids entertained. 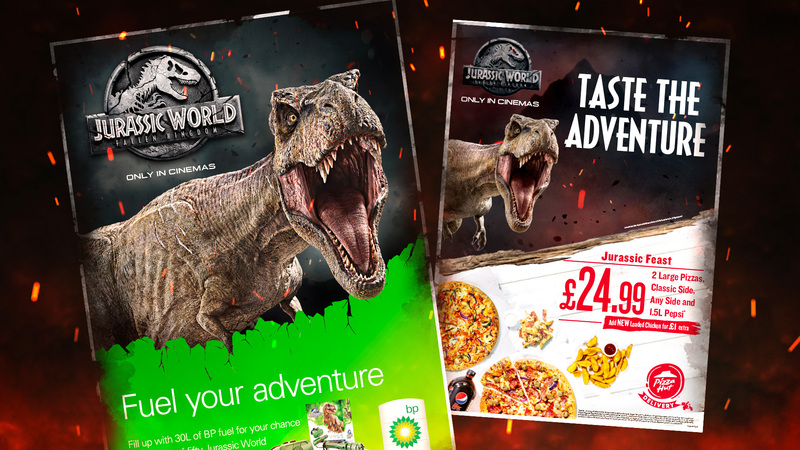 Their ‘Fuel Your Adventure’ collaboration was hatched in association with Jurassic World: Fallen Kingdom – a movie franchise that’s all about evolution, innovation, advanced technology and adventure, fitting BP’s brief perfectly. Across 1,300 BP service stations and forecourts, OOH advertising and promotional POS pushed the campaign, offering consumers the chance to win themed prizes with the purchase of BP fuel. With a headline Hawaii trip up for grabs, thousands of Jurassic World VR head sets were also on offer, with 50 to be won every day during the 8-week summer promotion. BP also gave families the opportunity to download and play a variety of Jurassic Word themed games to keep their journeys interesting. The OOH and POS promotion included forecourt posters, branded bollards, nozzle talkers, self-service wobblers and peel to reveal scratch cards to participate in the BP competition. BP goes head to head with Shell this summer who are also leveraging film with activity around Paramount’s Mission Impossible: Fallout. Who did it better… you decide!